Exeter Guildhall is an extremely well documented building, and building work can be followed week by week in some periods when work as in progress. 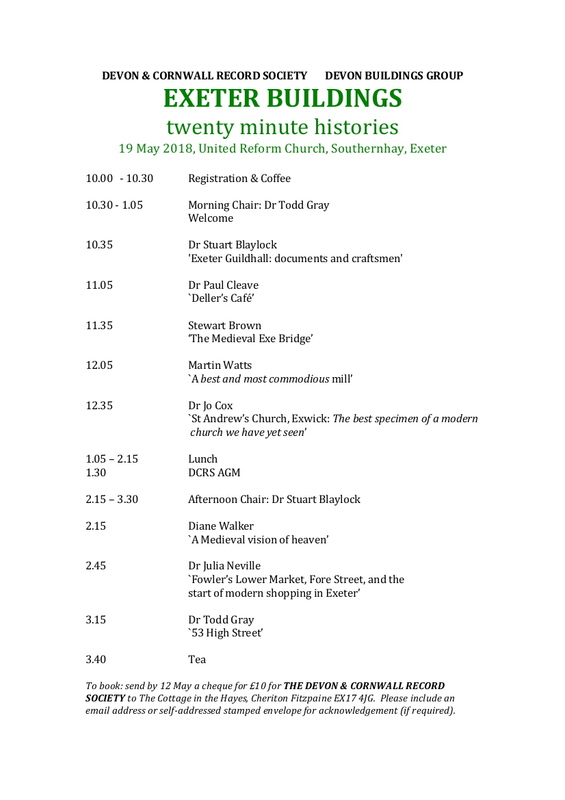 The talk will discuss the main periods of new building and repairs, as testified by the Exeter City archives, with particular emphases on the relationship between the documents and the standing fabric and on the numerous named craftsmen involved in the rebuilding of the front block in the 1590s. Deller’s is still an evocative name, and the loss of the Café in the 1942 Blitz made Exeter a duller place wrote W. G Hoskins. Its architecture, innovative management, ambience, service, and food were among the sophisticated features enjoyed, and remembered by patrons, that made Deller’s Bedford Street premises unique as a provincial cafe. Utilising contemporary resources (photographs, menus, and marketing material) this presentation will show how the café became a landmark, a social centre, and rendezvous for citizens and visitors. The bridge dates from c.1200 and was one of the earliest major bridges built in England. It had buildings erected on it and stood for almost 600 years before it was replaced. Nine of the seventeen or eighteen medieval arches survive today as ruins which have been conserved and are open to the public. 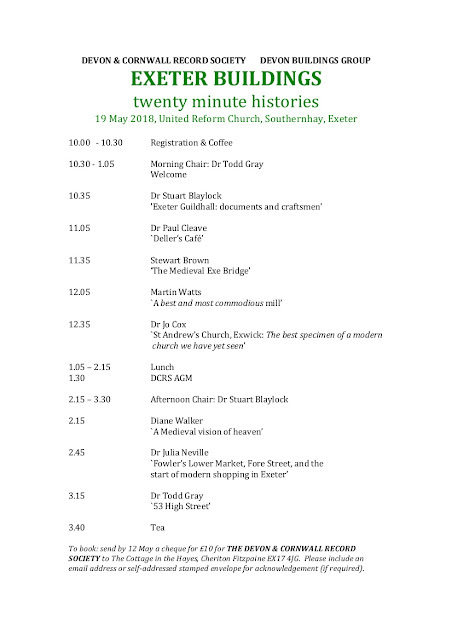 The story of Cricklepit Mill, on Exeter's higher leat, can be traced through a variety of documentary sources from the time of its building in the early 13th century to the present. These records enable a comprehensive time line of the mill's history and development to be constructed. Fortunately a detailed building and archaeological survey was carried out before a serious fire in 1999 which damaged the upper floors and destroyed the roof of the building. The subsequent re-use of the mill as the headquarters of the Devon Wildlife Trust has seen the conservation of the building and the repair of its surviving waterwheel and machinery. Cricklepit Mill is a remarkable survival of a working watermill in an urban setting. Described in a contemporary source as ‘The best specimen of a modern church we have yet seen’, St Andrew’s church was built in 1841-2 as a chapel of ease to St Thomas church, Cowick Street. The project was a a partnership between two of the leading lights in the Gothic Revival in the diocese of Exeter: the architect John Hayward and the Reverend John Medley. Jo Cox will talk about some of the sources for understanding this building. A review of attempts to identify the figures on Exeter Cathedral’s West Front Image Screen. The paper will trace the history of these attempts and will include Diane’s most recent re-interpretation of the evidence about one group of figures. Charles Fowler, the Cullompton-born architect who designed Exeter’s Lower Market, was one of the forefathers of Victorian market hall design. His design for the Lower Market set out a high, light covered shopping space with a technically innovative roof design, a complete contrast to the street markets that it replaced, providing a cleaner, safer, easier-to-regulate shopping environment. It changed the practice of shopping in Exeter for producers and customers alike. Victoria House was transformed in 1907 by a national chain store but with the use of Exeter’s leading firm of carvers. The building has shared an unsuspected history with others across Britain.